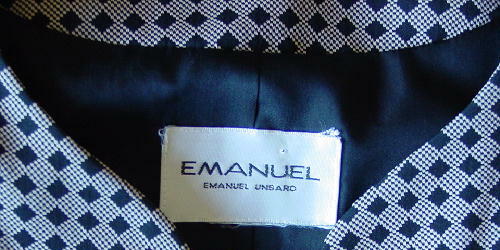 This vintage Emanuel Ungaro jacket is 50% rayon and 50% acetate and was made in Hong Kong. 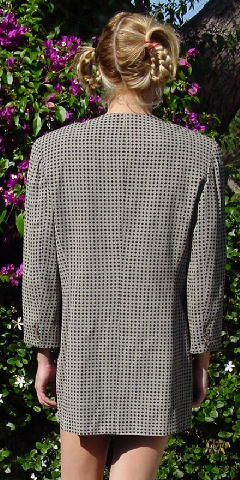 It has a box and diamond pattern in black and bone-beige, and two front lower slash pockets, one of which is still sewn shut. It's collarless and has a one button front closure and 3/4 length sleeves with three decorative buttons on each. The buttons are in brown and yellow-beige. It's from a stylists' inventory. shoulder to end of sleeve 20 7/8"
shoulder to hem 30 1/4"